A lot of folks over the years left these pretty green hills to cross the Ohio River in search of a better life regardless of what might lay ahead, because in many cases it had to be better’n here. My pursuit of hearing these many stories of life from the pickers and artists of my part of the foothills took me to Fairborn, Ohio, to the home of Clarence Kelly, a picker from Spaw’s Creek, over in the Caney region of Morgan County, Kentucky. Clarence Kelly, like many young men reared in this ancient mountain range we call the foothills of Kentucky has lineage tied to the lowlands of Scotland. He was a free-range kid who claimed the hills, trees and streams as his playground and was raised up during a time when it was common for a 10- or 11-year-old kid to kill a squirrel or rabbit and bring it home for supper. “Money was damn near nonexistent for us,” Kelly explains as he returns to the Caney/Spaw’s Creek area and the remote austere life he lived with his father Santford Kelly. Santford was a noted old-time musician and man of the hills some might refer to as a mystic, maybe as well known for his herbalist skills as his fiddling. The fiddle songs of Santford Kelly were archived at the University of Kentucky, Western Kentucky University and Morehead State University at the Kentucky Center for Traditional Music. “Hobart would bring Ricky to where my Daddy would be playing, and he picked up on Daddy’s style and still does some of that type of playing today,” he said, referring to legendary Ricky Skaggs and his father, also out of the same area. Aside of the Skaggs recordings of “Fiddlin’ Sam,” as Santford was known in the region, Peter Hoover recorded and documented the music of this cultural icon in the 1960s. One might find more on Santford here. He said, “There are two kinds of music, Clarence: the kind that makes people happy, they want to laugh and dance and that’s good. And there’s the kind that makes folks want to bow their head and think, the kind that makes tears come from their eyes. Do one of these and people will never forget you, but everything else in between really ain’t worth doing. You need to decide what kind of music you want to do.” It was 30 years later after many a long night being somewhere in between that Clarence took a one-year hiatus from live music, but we will get to that. In the early 1970s, Santford Kelly passed into time and took with him the political influence and local pull that had been sometimes required to reign in young Clarence, who was developing a growing chip on his shoulder. Inequality rears its ugly face generally always in places like school, where those that have seemingly have carte blanche when it comes to the have-nots. Growing up a free-range child and for the most part living off the land, young Clarence wasn’t shy about expressing himself, sometimes with a violent nature. “Today our society would say I was a troubled youth. I’m not sure I was as much a troubled youth, as the folks there in town were troubled with me,” Kelly grins as he recollects his sudden departure from Morgan County. So in the early 1970s, Clarence Kelly left these pretty green hills without a choice and not much of a chance, 17 years old and alone. Clarence made that journey down the treacherous Highway 519 to Morehead, catching 32 over to Flemingsburg where Route 11 will get you to Maysville and the bridge across the Ohio River. Once across the river, Clarence caught Highway 68 and landed in Fairborn, Ohio, just outside of Dayton and what had been the hottest bluegrass scene in the country. “At that point I had been doing the bars for some time, and the Frontier Ranch thing began the shift out of clubs to the festivals,” he explained. After several years of working a day job and nights doing bluegrass with as many gigs, festivals and covers as possible, Clarence found himself burned out on that music somewhere in between and walked away in 1987. He was in that place his Daddy had warned him about. 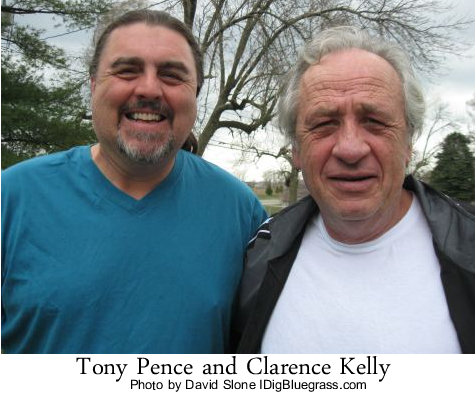 The Clarence Kelly that re-emerges in 1999 has hooked up with legendary Bill Monroe band member Noah Crase and Carlos Brock, and Red Allen’s guitar man Clarence Baker. I had mentioned earlier about Dayton being a hotbed of bluegrass. More than a few notable names of bluegrass honed their skills on the stages around Dayton, the likes of Jimmy Martin, Red Allen, Jim and Jesse, Sonny and Bobby Osborne just to name a few. Clarence Kelly, with this collaboration of Crase, Baker and Brock, reinserts Fiddlin Sam’s boy into the bluegrass business. The band takes the name The Bluegrass Legends and once again was taking the stage doing songs that had made their bandmates famous over the years and Clarence was right in the middle of it. The Bluegrass Legends had a pretty good run once again with Clarence out front, but as time has its say, miles and age brought that touring group to the summit. But Clarence Kelly is a man long-driven and matured into an artist. Clarence by now owned that commercial roofing business and had traveled to China at least 15 times developing roofing products. He was now his own man. In the core of Clarence Kelly’s soul, he heard the music of the pretty green hills taught him by Fiddlin’ Sam on the porch, in the kitchen and in the living room of the shack of a house that was home. This unique music of the mountains, sifted by time from the means streets and hills of Ireland, England and, yes, the Lowlands of Scotland, runs a course through your veins if you were lucky enough to have been born and baptized into it. 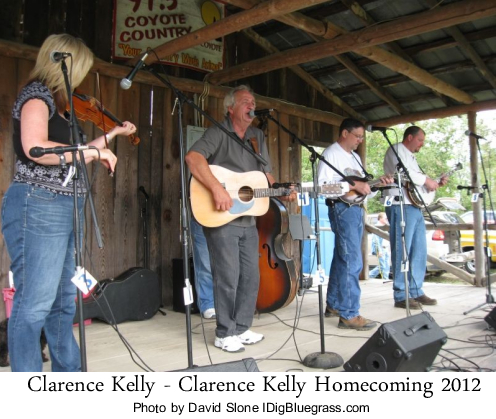 The Bluegrass Legends void was filled by a new assembly, New Cut Road, as Clarence began to present primarily original material instead of the Standards. Kelly tells me it took a while for folks to come around to hearing new and original material, but they did. 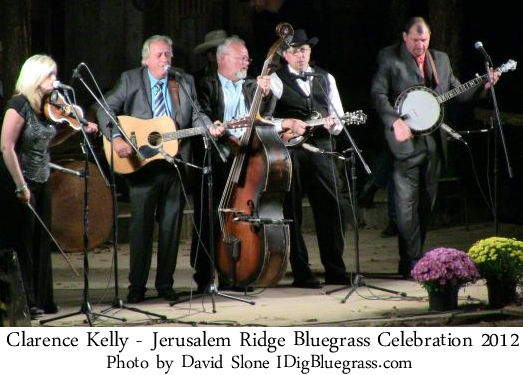 Three recording projects later, Kelly has sold into the thousands of CDs and has recorded with the likes of Don Rigsby, James King and Marty Raybon. These three artists were all featured on Kelly’s 2009 release on Sagegrass Records, titled “A Trip Back in Time.” Kelly also released “The Mountains are Calling” in 2006 that included “South of Cincinnati and Mountain Laurel.” Clarence Kelly and New Cut Road released Stories of Life in 2011 that includes Kelly covering Carter Stanley’s “Lonesome River” and Mickey Newberry’s “San Francisco Mabel Joy.” There are plans to produce a new CD project in the fall of 2013 as Kelly recovers from back surgery that took place in March. Clarence Kelly’s music is bone-cutting in truth-revealing realities of life with as unique a delivery as were the fiddle tunes of his father Santford. His sound has a unique distinction having evolved note by note, one gray hair at a time, with the feller holding the pen and vintage Martin guitar now old enough not to give a damn and old enough to tell the truth. In the early 1970s Clarence Kelly was run out of West Liberty in Morgan County, Ky., on the proverbial rail, but when you cross the Morgan County Line today you will notice a sign. You see, Clarence doesn’t play bluegrass music for a living, he never did. 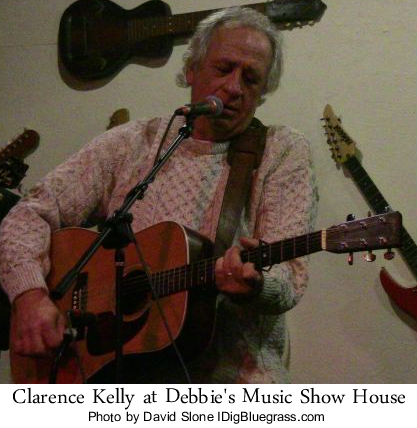 Clarence Kelly plays bluegrass and writes songs to sing because that is who he is and has been since he was a little boy on Spaw’s Creek. When West Liberty was devastated by the tornado last year, Clarence sent trucks of blankets and other supplies immediately to the shelters, following up with assistance he preferred to keep private. Written by Tony Pence, Copyright 2013 all rights reserved. Hey Tony! Killer article man. I mean it. I love Clarence Kelly’s style and sound very much. This story makes me feel like I know him a bit better and I can appreciate his music even more. He got his first guitar for 6 ducks! What a story! Clarence Kelly is one of the VERY BEST songwriters in the world. This is one of my favorites, but I equally love “Moma’s Apron Strings”. And there are so many other of his originals too numerous to mention. He and Paula are great individuals and awesome friends to be around. Thank you for sharing this song and this article. It’s great to see the music,, always changing and always the same, carrying on through the years in a family. For those of Clarence’s fans who don’t know of it, let me put in here a plug for Santford Kelly’s music, a bit of which I was lucky enough to record more than fifty years ago (http://fieldrecorder.org/product/santford-kelly/). Love you and Paula LOVE YOUR SONGS BEST BLUE GRASS SINGER I KNOW.